2013 UPDATE: I have refreshed and expanded this list on another website. Check out the series here: Introduction, #21-25, #16-20, #11-15, #6-10 and #1-5. First off, a big thank-you to everyone who read and provided feedback on the three-part “15 Worst Trades in Toronto Maple Leafs History” series. It was a blast to research and write the articles, and it sounds like I’ve struck a few chords. In response to Down Goes Brown; I read and respect your article on the Courtnall for Kordic deal. I do not argue against Kordic being acquired, the Leafs did have a number of small, fast young forwards in the hard-hitting Norris division. BUT… the price paid for Kordic was too high. As a point of comparison, the Leafs acquired Tie Domi from Winnipeg for a (marginal prospect) Mike Eastwood and a draft pick (a 3rd Round pick). That is a perfectly acceptable fee for an enforcer to toughen up the team. A near-point-per-game skilled forward is not. But as I said, I respect your opinion, and thank you for your feedback. Gen. Borchevsky, GREAT addition with the Doug Jarvis deal. I didn’t even realize he was ever a Maple Leaf prospect! 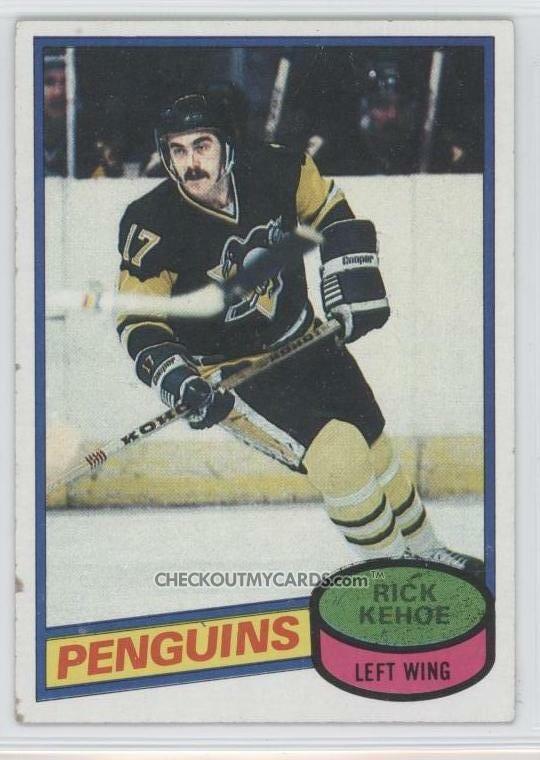 One deal I wish I had also recalled was the one that sent Rick Kehoe to Pittsburgh for Blaine Sloughton. 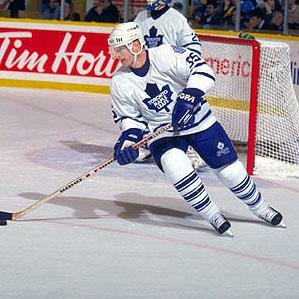 Kehoe was one year removed from a 33-goal, 75-point season with the Leafs. He went on to record 10 consecutive 45+ point seasons, nine of them involving 27 or more goals, and six of them involving 60+ points. 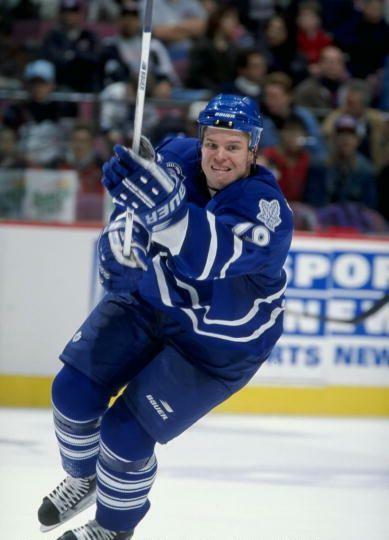 Blaine Stoughton would turn into a tremendous player… just not for the Leafs. 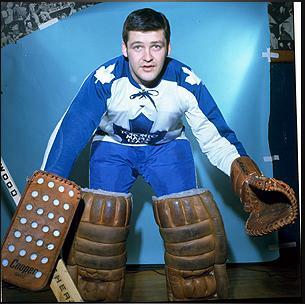 Stoughton left Toronto after two seasons for the WHA, much as Bernie Parent did. 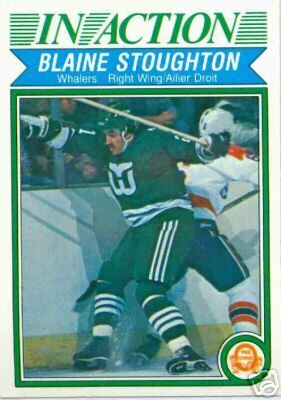 And when Stoughton returned to the NHL with Hartford, he became their first great player. In his first four NHL seasons with the Whalers he scored 196 goals and 340 points. I’m trying to look at both sides of the Leafs coin, however; I’m currently researching and compiling stats for the Best 10 (or possibly 15, if I can find that many) trades in Leafs history. Although I have to admit, my trade is looking VERY heavy on the 1988-2001 timeframe. No Leafs trade in the last 7 years has done much of anything for the franchise, and I haven’t found too many strong Leafs deals from 1970-1985. If anyone would like to suggest deals, please feel free to post a comment below, or email me at jt.urbaneblog@gmail.com. Welcome to Part Three of the worst trades in Toronto Maple Leafs history, the final look at some of the darkest (and dumbest) days in Toronto hockey. And now… on with the not-so-grand finale! Poor Gord Stellick… he’ll never live this trade down. The Leafs needed a goon, and the Habs were interested in Russ Courtnall. Apparently rather than haggle, the Leafs’ response was “Sure, why not.” How did the trade work out? Sadly, even worse than its reputation. 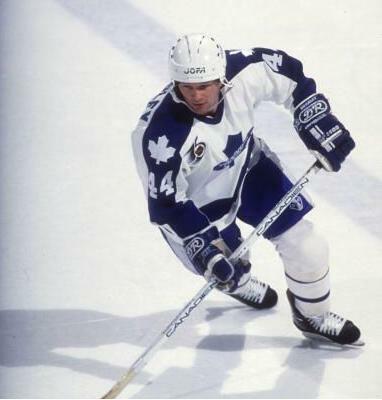 Kordin got 446 penalty minutes and 16 points in 104 games as a Leaf, while Courtnall gradually improved over parts of four seasons with the Habs. He ended up with 82 goals and 195 points in 250 games for Montreal. I know other trades have had closer margins in terms of the numbers, and ranked lower. But this is one of those trades that just lives in infamy. Plus the Leafs have had very, VERY few scoring wingers over the past 20 years, and barely a handful that were drafted by Toronto. 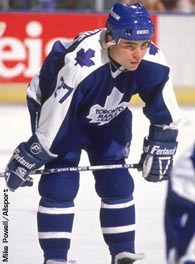 What’s worse, the Leafs traded Kordic and Paul Fenton for a 5th round pick for… Alexei Kudashov. Wow. Meanwhile, the Habs turned Russ Courtnall into Brian Bellows, who won a Stanley Cup with the Habs. And Courtnall kept on being a decent offensive player (and I believe an all-star) with the Dallas Stars. There are bad trades… and then there are truly wretched trades. This one falls into the second category. Toronto had a young goaltender on their roster that left the club to play in the World Hockey Association, which instantly made him an outcast in the eyes of Leafs management and ownership. Having played previously in Philadelphia with the NHL’s Flyers and the WHA’s Blazers, he requested a trade to Philadelphia. His request was granted… and in his first two seasons with the Flyers, Bernie Parent won two Stanley Cups, two Conn Smythe trophies as the MVP of the playoffs, and two Vezina trophies. So he was the best goaltender in the league, and the most valuable player on the back-to-back Stanley Cup champions. He was also incredible during the regular season, posting a record of 177-60-57 in 298 games over six seasons. Doug Favell meanwhile was a complete bust. He was decent for the Leafs in his first season, just plain AWFUL in his second, and gone his third season lasted just three games before he was shipped to the Colorado Rockies. And the Leafs failed to make a significant impact with the draft pick. They had two other first rounders that year. The other two (Lanny McDonald and Ian Turnbull) were stellar picks. Bob Neely posted decent numbers as a defenseman, but after four seasons and change he was gone, and he only played 22 games after leaving Toronto. Not much staying power. Essentially, the Leafs received four seasons (3 of them decent) from a mid-level defenseman and two seasons (one of them good) from a back-up goaltender from a man who was possibly the best money goaltender in the 1970s. BRILLIANT!!! And don’t give me that 20-20 hindsight crap; Parent posted better numbers in his two seasons in Toronto than Favell did in his entire career. On the surface, the first trade looks harmless. Boston didn’t do much with the draft pick, and Khristich’s numbers in year one (30 points in 53 games) suggest a decent hockey player. Don’t let that fool you, he was AWFUL. His second season (9 points in 27 games) was so bad the Leafs dumped him on Washington for a 3rd round pick in 2001 (which turned into Brendan Bell… who then, in keeping with Leafs’ tradition, turned into 17 games and 5 points from Yanic Perreault). Khristich is the closest thing to a Maple Leaf player that I hated except for Mike Craig. So on the surface, you’re probably wondering… a 2nd round pick for a 6-time 27+ goal scorer isn’t that huge of a risk, why is this trade so high? Two reasons. First, the rumours (which I believe) were that Boston walked away from Khristich’s arbitration settlement, thus making him essentially a UFA. Instead of just SIGNING him, Leafs GM Pat Quinn traded a 2nd round pick to Boston for Khristich’s rights to “keep the peace”. The second reason why this trade is so high was that, in order to make space for Khristich, Quinn put a young, small forward on waivers. Quinn preferred veterans, and big tough players. And the Chicago Blackhawks plucked Mr. Sullivan off waivers. 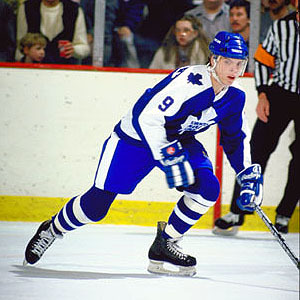 Steve Sullivan, since leaving Toronto, posted seven consecutive seasons where he scored 22+ goals and recorded 60+ points. By the way, that would have placed him SECOND in Leafs scoring for five of those seasons, third for another, and somewhere in the Top Five for that final season. Yes, I am saying that in those seven seasons, five of those seasons lacked a Leafs player named Sundin scoring 60 or more points. Sullivan scored 303 points in 370 games for Chicago, raising his stock such that the Nashville Predators traded for him at the 2004 trade deadline at a cost of two 2nd Round draft picks. He then scored 158 points in 150 games for the Predators before sitting out the 2007-08 season due to injury. Just a terrible, TERRIBLE trade, one that confirmed the Leafs squandered all the resources they received (Sullivan, Jason Smith and Alyn McCauley) from the Doug Gilmour trade. Imagine how good that trade would look if those three players were still in Leaf uniforms today, over 10 years after Gilmour was sent to New Jersey. Most people will question this trade being so high on the list, especially considering the Pittsburgh Penguins were hardly a powerhours during the late 70s and early 80s (which ultimately led to their getting Mario Lemieux 1st overall in 1984). Dave Burrows did absolutely nothing for Toronto. In just over 2 seasons, he recorded 32 points in 151 games, and then he was gone. George Ferguson meanwhile recorded four straight 20-goal seasons, and was even a strong performer in Pittsburgh’s first-round exists (15 points in 22 games). But Randy Carlyle was the true gem of this deal. He played 397 games as a Penguin, recording 323 points. As a DEFENSEMAN. In fact, he won the Norris trophy as the NHL’s best defenseman, recording 83 points in 1980-81. He then went on to play another 564 games for the Winnipeg Jets, recrdong another 306 points. Despite playing on some truly terrible teams that rarely made the playoffs, he still recorded 31 points in 53 playoff games after leaving Toronto. Again, as a defenseman. But wait, it gets worse (as if we needed worse giving up a consistent 20-goal man and a 1,000-game defenseman) is that the Penguisn were SMART with their assets. Ferguson and the 1st overall pick in 1983 were traded to the North Stars for Minnesota’s pick and two players. The players didn’t amount to much, but Pittsburgh selected long-time Penguin Bob Errey. And Carlyle was traded to the Jets for a 1st round pick in 1984 and Future Considerations. The FC ended up being Moe Mantha. Mantha recorded 168 points in 232 games for the Penguins, before becoming part of the Paul Coffey trade, which (after the ’91 Cup) in turn led to the trade that brought Kjell Samuelsson, Rick Tocchet and Ken Wregget to Pittsburgh (helping the Penguins get the ’92 Cup). As for Doug Bodger, after contributing 167 points in 299 games, Pittsburgh dealt him to the Buffalo Sabres for goaltender Tom Barrasso (an important part of the ’91 and ’92 Cup wins). So the Penguins turned Randy Carlyle into various components of one of the few back-to-back Cup champions of the last 20 years. *sigh* It’s very depressing writing about a team that knows how to continually turn over their high-value assets into new, long-term assets. If only Craig Patrick had been Leafs’ GM… he would have moved Tucker, McCabe and possibly Sundin in 2005, rather than signing them to no-movement clauses after yet another 1st-round exit. 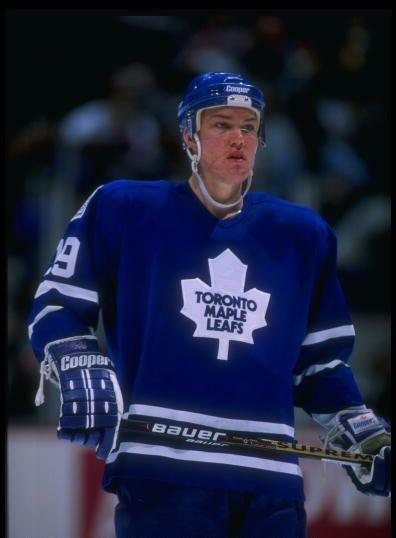 And here we are… the most infamous trade in Toronto Maple Leafs history. Now I know that earlier I stated that I ignore the draft choices made by other teams, because there is no guarantee that Toronto would have chosen that player (i.e. the Islanders choosing Roberto Luongo with the draft pick from the Leafs). However, in this case I can argue that Toronto would almost assuredly have chosen a player of consequence. Of the 22 players chosen in the first round, 17 have played in at least 575 NHL games as of August 2008. Of the other five, two of them still managed to play over 100 games (and one of them was traded for Markus Naslund). That’s a 77% chance that Toronto would have had received 575+ games from a first rounder, and an 86% chance of receiving 100+ games (which is more than they got out of Tom Kurvers). And now comes the clincher. The Leafs were bad in 1990-91… so bad that they were on pace to finish last in the NHL behind the Quebec Nordiques. And Toronto was feeling the sting of Kurvers not working out as expected. So the Leafs traded prospect Scott Pearson and a pair of 2nd Round picks to Quebec; the Nordiques selected Tuomas Gronman and Eric Lavigne. However, you cannot say the trade did nothing for Quebec. What it did was send three regulars to Toronto; Aaron Broten, Lucien Deblois and Michel Petit. They weren’t exactly all-stars, but they were regular players on Quebec. Their removal necessitated their replacement with younger, less talented players. The Leafs even picked up another Nord (Claude Loiselle) near the trade deadline. Now why you ask would the Leafs trade Pearson (their 1988 1st Round choice) and a pair of second round picks for three players from the worst team in the league? Because by making Quebec slightly worse and Toronto slightly better, it diminished the chances of Toronto finishing last overall in the league. Sounds like a noble goal… except the SOLE reason the Leafs did this was to avoid their last-place finish turning their draft pick into the first overall draft choice. This would result in New Jersey turning Tom Kurvers… into teenage phenom Eric Lindros. 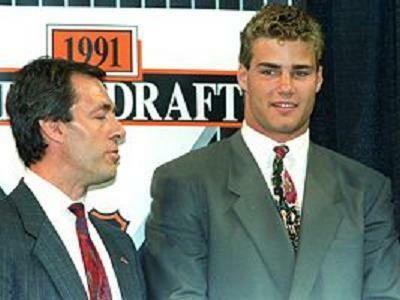 Before you say so what… in 1991, Eric Lindros was THE next great player. Not an Alexander Daigle “he might be the next one”… we’re talking a Sidney Crosby “he WILL be the next one”. Lindros scored 71 goals and 149 points in 57 games during his last juniour year. He was so good that he was picked as an 18-year-old to play on the 1991 Canada Cup team. A team so deep that Steve f’n YZERMAN never dressed for a single game. And even though his career can be called disappointing, Lindros still recorded 372 goals and 865 points in 760 games. Fortunately for the Leafs, their Quebec raids paid off, and the Nordiques finished last in the league, giving them the first overall draft pick. 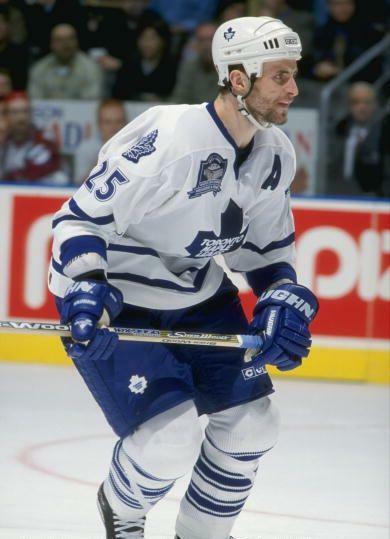 The funny part is, rumours swirled a year later that Toronto offered a package including Doug Gilmour, Wendel Clark, Dave Ellett and possibly Felix Potvin to Quebec for Lindros before the Nordiques finally dealt him to Philadelphia. But getting back to the trade. We already know that it potentially cost Toronto the only true superstar this generation of Toronto fans would have seen (I like Gilmour and Sundin, but neither one of them was a superstar… the last one we had was Sittler). The Leafs breathed a sigh of relief; Quebec’s finish and the San Jose Sharks joining the NHL meant New Jersey picked third. 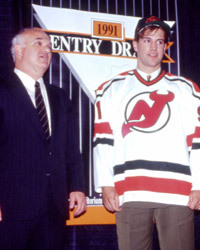 And the Devils chose very, VERY well; Scott Niedermayer. Niedermayer is one of the true great defenseman of this (or possibly any) generation. He scored 476 points in 892 games with New Jersey, winning Stanley Cups in 1995, 2000 and 2003 (and very nearly another one in 2001). He then signed with the Anaheim Ducks as a free agent, where he added another 157 points in 209 games, and a fourth Stanley Cup ring in 2007. He also won a Memorial Cup (the Canadian Juniour Hockey championship), and gold medals at the World Juniour Championship, the World Championship, the World Cup (of hockey) and Winter Olympics. The man was a winner on every single stage that he played. The truly sad part… picking first or third (assuming they were smart enough to pick Niedermayer) would have given the Leafs a TRUE franchise player who would have spent 10+ seasons in their uniform. Any number of players from the 1991 draft could have boosted the club’s fortunes longer term than Kurvers/Bradley. You want scoring? Peter Forsberg went 6th overall, and other options included Brian Rolston, Alexei Kovalev, Markus Naslund, Glen Murray and Martin Rucinsky. Defense? Scott Lachance, Aaron Ward, Richard Matvichuk and Philippe Boucher all played 700+ quality games. Even a “bust” like Pat Falloon scored 322 points. This was the trade that truly bottomed out the franchise at the end of 1980s. Think of a 19-year-old Eric Lindros or Scott Niedermayer playing on the 1992-93 Leafs alongside Gilmour, Andreychuk, Clark and Potvin. It would have completely changed the dynamic of the team. And Sundin would have had some help keeping the team from being awful in the mid-to-late 1990s. Lindros or Niedermayer might have been enough to turn one of those Conference Finals runs into a Stanley Cup Final apperance… or heaven forbid, a win. 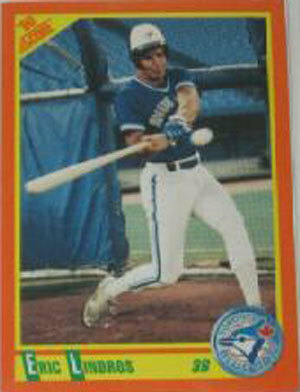 And worst-case scenario, Lindros might even have helped out the Blue Jays. That’s the beauty, and the pain of sports… the what-if’s, the could-have-been’s, and the wish-they-weren’ts. But then that’s also the reason why lists like this are possible. Every team has their share of glorious moments and tragic instances, and it’s unfortunate that Toronto has had more than their share. I hope you’ve enjoyed reading these “Top 15” worst trades in Toronto Maple Leafs history as much as I enjoyed reading them. I’m sure we haven’t seen the last of bad Leaf trades, and no matter what happens we will always cling to our hope that another Gilmour-type trade will bring the franchise back to life. Go Leafs Go! Welcome to Part Two of the worst trades in Toronto Maple Leafs history. One thing I should mention is that I did not consider any trades from before 1967. The reason is because the Original Six NHL was incredibly different from the one today, and the majority of awful Leaf trades happened after the 70’s anyways. And now, on with the list! Right off the bat, I will admit to some fairly blatant bias here. I HATE Mike Craig. I hated him in Minnesota/Dallas, and I LOATHED him in Toronto. I have never hated a Maple Leaf player before or since; but I hated Mike Craig. He was a 15-goal, 30-point player that the Leafs signed to an offer sheet for who-knows-what reason. And in 3 seasons in Toronto, 172 games… he managed 20 goals. No, not a season… TOTAL. 20 freakin’ goals and 50 points. Oh, and in the playoffs? One assist in 8 games. ARGH. And the compensation package was ridiculous. Peter Zezel didn’t last very long with the Stars, but he was an incredibly competent checking centre for a grind line that the Leafs SORELY lacked for a number of years after the Berg-Zezel-Osborn combination was disbanded. What’s worse, the Leafs also lost decent prospect Grant Marshall (their first round pick from 1992!). He played 402 games with Dallas, recording 134 points as a decent two-way player. And SINCE Dallas, he has played another 298 games. Oh, and did I mention he’s won a pair of Stanley Cups, one with Dallas and one with New Jersey? A strong two-way forward who has (so far) played 700 career games, and the loss of Zezel for 172 games from Mike f’n Craig. It would have been better if Cliff Fletcher (or whoever made the decision to sign Craig) offered me $20 to ro shambo him. No I’m not bitter, why do you ask? This was a trade that began the franchise’s descent into the hell that was the 80s, a decade in which the Leafs had a record of 301-481-98 between 79-80 and 89-90 (a win percentage of .398, during a time in which surrendered 660 more goals than they scored). 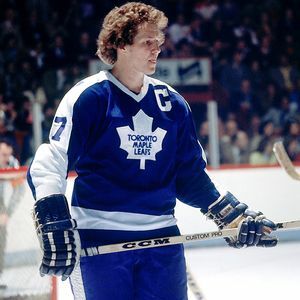 It is also widely reported that the deal was intended to demotivate Leafs captain Darryl Sittler. Only in Toronto would a personal vendetta come before the success of the club. Pat Hickey was an unexpected bonus at first; he recorded 22 goals in just 45 games during his first half-year with the club. But the next season he was quite ordinary, and one game into the following season he was gone. Meanwhile his counterpart Joel Quenville was a servicable defenseman for Colorado, following the club to New Jersey. He went on to play 710 games after leaving the Leafs. At first glance, the superstars in this trade worked out well. Toronto got 187 games and 203 points out of Paiement, while Colorado got 142 games and 141 points from McDonald. Paiement even recorded a stellar 40 goals and 97 points in his first full season in Toronto. But when he dropped to 18 goals and 58 points the following seasons, the Leafs traded him to Quebec for Miroslav Frycer and a 7th rounder. 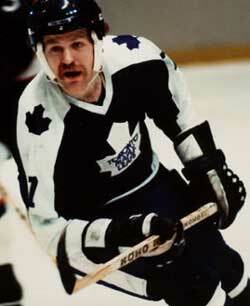 Yes, that’s right; Miroslav Frycer was all the Leafs had to show for dealing heart-and-soul Lanny McDonald. Colorado didn’t fare much better; they dealt McDonald to Calgary, where he played another 492 games (!!! ), and won a Stanley Cup in his final season (1988-89). Lanny scored 66 goals in his first full season in Calgary, and ironically Joel Quenville ended up in Calgary as well. This trade is #9 for two reasons. First, looking at the numbers, the trade isn’t as bad as you might suspect. Paiement’s contributions in Toronto were superior to McDonald’s in Colorado, and the Rockies traded McDonald for spare parts Bob MacMillan and Don Lever. This prevents the trade from being higher. But what keeps this trade in the “Top” 10 is the fact that the Leafs were TRYING to shoot themselves in the foot to hurt their captain, AND they squandered the resources they received (Paiement) for a player (Frycer) who was a regular “contributor” on some of the worst Leaf teams of all time. While this is technically not a trade, the Leafs had the option to leave anyone they wanted available in the expansion draft for Ottawa and Tampa Bay. Mike Krushelnyski was nearing the end of the road, as was Mike Foligno. Joe Sacco was a nothing prospect of limited potential. Mike Eastwood, Dave McLlwain, Ken Baumgartner. Granted, I’m not 100% certain who was protected, but there had to be someone else besides Bradley that could be protected. He finished sixth on the club in scoring in 91-92! But for whatever reason, the Leafs let Tampa Bay snag him. And what happened? 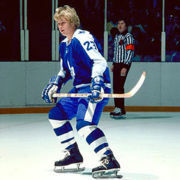 He scored 42 goals and 86 points for the Lightning, and then proceeded to record 300 points in 328 games over six seasons before retiring due to injuries. He was the Lightning’s face of the franchise until Vincent Lecavalier came along, and he lead the Bolts from game one to their first playoff birth in 1996. And the Leafs let him walk for nothing. Just to put Bradley’s 300 points in perspective; do you know how many Leafs have scored 300 points in Toronto? 32 players. In 72 YEARS. Leafs GM/Coach Pat Quinn was not a fan of Jason Smith, and shipped him off to Edmonton. And you know what we kept hearing on TV and in the papers for the next few years? “We could really use a big, physical defenseman to clear the net and project (Curtis) Joseph in goal.” Gee, where can we find one of those? Oh, I know… EDMONTON. Jason Smith became one of the most popular Oilers since Doug Weight and Ryan Smyth, playing 542 games and eventually being named team captain. He has since been traded to Philadelphia, which caused Oiler Ethan Moreau to say the following: “I didn’t even ask who we got. I don’t really care right now if we’re better or worse, it’s more the human side of it. You lose a great friend and a great leader, the longest standing Oilers captain of all time.” Obviously a very talented, very respected player. And a true leader. Well the LEafs must have gotten something good in return, right? Hell, you already know the answer to that; if it was “yes”, then it wouldn’t be on this list. Mr. Zion (who sounds like an extra from the Matrix) never played in the NHL. Kris Vernarsky played 17 games… but not in Toronto. The Leafs traded him to Boston for Ric Jackman. And RIGHT before Jackman became a decent defenseman for a few seasons… the Leafs traded him for Drake Berehowsky. So to sum up, the Leafs traded an additional 619 games (and COUNTING) of Jason Smith for 42 games (and 8 points) from Ric Jackman, and 9 games (3 points) from Drake Berehowsky. Huzzah. This was a dark day for the Toronto Maple Leafs. They traded their captain, their best player since Dave Keon, and a man just 84 points away from becoming the first Toronto player ever to record 1,000 points in a Maple Leaf uniform. And he would have done it for SURE; he recorded 178 points in 191 games as a Flyer, and then added one last season in Detroit before retiring and going on to the Hall of Fame. It’s just sad what they settled for in return. Ken Strong? 15 NHL games, then disappeared to Austria for a decade. Rich Costello? 12 NHL games. Only Peter Ihnacak made the club. He recorded 28 goals and 66 points and then recorded just 201 points in his final 337 games as a Leaf before returning to Europe. He’s right up there with Frycer as regulars on some of the worst hockey teams in Toronto (and NHL) history. 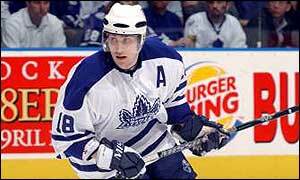 A dark day, a bad trade… and a team that will likely not see a 1,000 point scorer in our lifetime; Sundin has 987 points as a Leaf, but he’s as good as gone, and the next closest active Leaf is Tomas Kaberle with 402 points. It’s trades like these that give people the justification to make photos like THESE. Well that wraps up the second portion of our list. Part Three has been posted here after a few days break (necessitated by a combination of the time required to compile and rank the trades, and a need to walk away from the sheer amount of RAGE that builds up whenever I research just how truly godawful these trades were). Feedback is always welcome, either here in the comments or via email at jt.urbaneblog@gmail.com. I know this blog is pop-culture focused, but sports are definitely a part of popular culture. And one sport that struggles for popularity outside of a few stronghold countries is hockey. But like any sport, there are a few teams that are institutions. Baseball has the Yankees, basketball has the Lakers and Celtics… hockey has the Original Six teams. 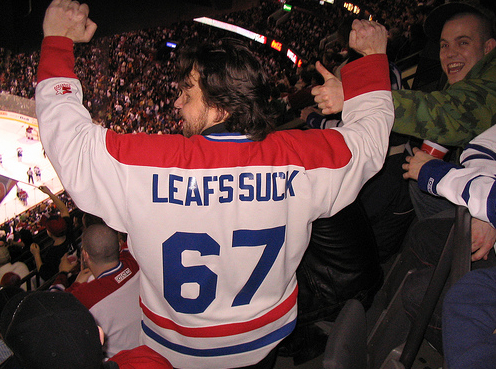 And possibly the most painful of those teams to be a fan of is the Toronto Maple Leafs. 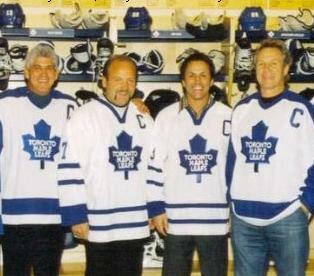 The picture above shows the four most popular Leafs captains of the past 30 years. None of them were allowed to retire as Leafs captain, and two of them were dealt in such brutal trades that they fall into the list which begins shortly. You see the Leafs were once a storied NHL franchise, rich in success, talent and Cup wins. A number of factors helped contribute to their downfall; then the NHL began expanding, the rival World Hockey Association began siphoning off talented players, and the infamous Harold Ballard took over as majority owner and drove what little pride remained from Maple Leaf Gardens. Some teams would be able to persevere through these challenges, if they can continue to make smart personnel moves. Unfortunately… the Leafs have made more than their share of bad trades since they won their last Stanley Cup some 40 years ago. Here are the first “highlights” from that group. This trade is mentioned frequently as an awful trade, due to Vaive’s success with the team (and the fact that he is one of only two players to score 50 goals in a single season wearing a Leafs jersey). However, the numbers tell a different story. Vaive played just 106 games in Chicago, scoring 55 goals, before being dealt to Buffalo, where he was a shadow of his former self, and he faded away a few seasons later. Thomas was strong for the Blackhawks, but not a star; he recorded 198 points in 231 games before being shipped off to the New York Islanders. Bob McGill was servicable, but didn’t do much of note in four seasons with Chicago. Now Al Secord was a mistake to acquire, one which the Leafs rectified just a year and a half later by shipping him to Philadelphia. But Ed Olczyk was spectacular. He averaged 37 goals and 84 points in his 3 full seasons with Toronto. 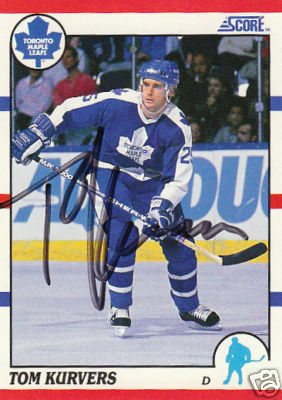 And when he was traded to Winnipeg, he netted the Leafs Dave Ellett, who was a huge component of the beloved ’92 and ’93 Leafs teams. Given Olczyk’s performance and Vaive’s disctinct lack of staying power post-Leafs, I’d actually call this trade a win rather than a loss. And ironically enough, everyone but Vaive ended up having a second stint with the team that traded them (Olczyk and Secord played again in Chicago, while Thomas and McGill were Leafs in the 90s). I will fully admit that I have some bias here. I knew the SECOND we traded for Raycroft that it was a mistake. NO Bruins goaltender since Andy Moog has ever been good for more than 18 months. Jon Casey, John Blue, Blaine Lacher, Jon Grahame, Byron Dafoe, Bill Ranford (the second time), Jim Carey (not the actor)… the list goes on. And you can add Raycroft to this list. If Rask even turns out to be HALF as good as people thing, this trade will still belong on this list. And it’s not the first time Toronto gifted a great goaltender to Boston. Okay, so technically this isn’t a trade. And losing Cheevers was necessary to keep both Johnny Bower and Terry Sawchuk, the goaltending tandem that won the Leafs the Stanely Cup in ’67. 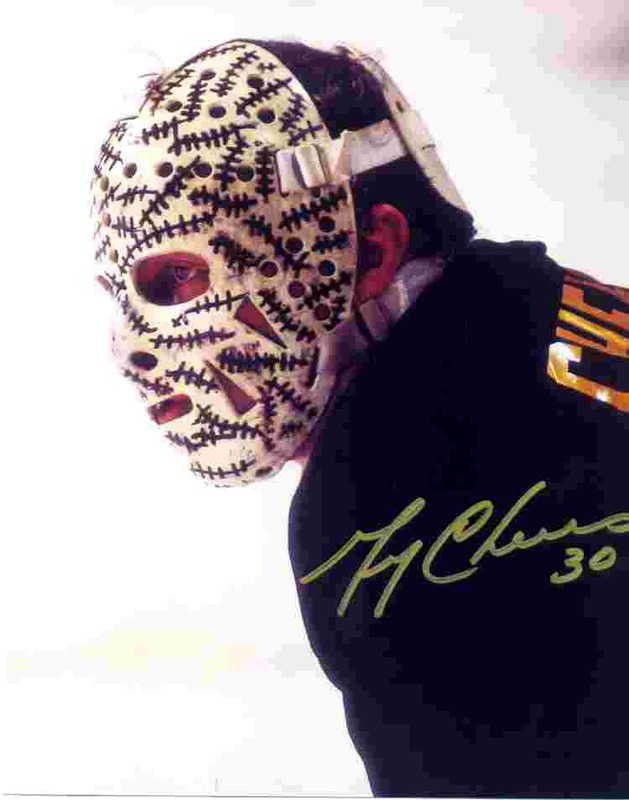 But come ON, did they have to let Gerry CHEEVERS go? The guy won two Stanley Cups with Boston, helped win the Summit Series against the Soviet Union in 1972, posted a record of 230 wins, 102 losses and 72 ties in 418 games, and won FIFTY-THREE of 88 playoff games with the Bruins. And he came up with the coolest goalie mask ever. How could they let him go for NOTHING??? I was hesitant to put this on the list, because I sincerely doubt Modin would ever have developed into a decent hockey player in the hockey fishbowl that is Toronto. However, he developed into a solid forward for Tampa Bay, averaging 24 goals a season over six years with the club, including three seasons of 50+ points and two 30-goal seasons. You know, the kind of seasons one needs from decent offensive wingers, which have been sorely lacking from Toronto for a number of years. Meanwhile poor Cory was a healthy scratch half the time, and despised by many fans the other half of the time. Funny story; I attended a game in Tampa during the late 90s between Florida and Tampa. 8 fights, 3 of them involving Enrico Ciccone. These four guys in front of me were riding Cory ALL night, taunting him every time he touched the puck. Anyways, on one play a Lighting player was hit VERY hard into the glass and knocked out, leading to a huge brawl. The arena erupted into jeers and everyone was pumped up. All of the sudden, one of the four guys went “Oh its okay, it was only Cory.” And all four promptly sat back down again, calmly sipping their beers and waiting for play to resume, despite the rest of the arena calling for blood. This trade irks me to no end. Toronto traded for Murphy from Pittsburgh, and the guy recorded 60 points. As a DEFENSEMAN. And Leaf fans rode him mercilessly. I’m pretty sure the last Leaf defenseman to do that was Al Iafrate in 89-90, and I don’t think it happened again until Bryan McCabe two seasons ago (and look how beloved he is). Anyways, the Leafs were SO desparate to get rid of Murphy that Detroit simply had to pay 2/3 of what was left on his contract. That’s right; the Leafs paid 1/3 of Murphy’s salary AND got nothing in return. And all he did was score 171 points over the next four seasons and win two Stanley Cups. And DURING those two Cup wins, he scored 26 points in 42 games for the Wings. ARGH. 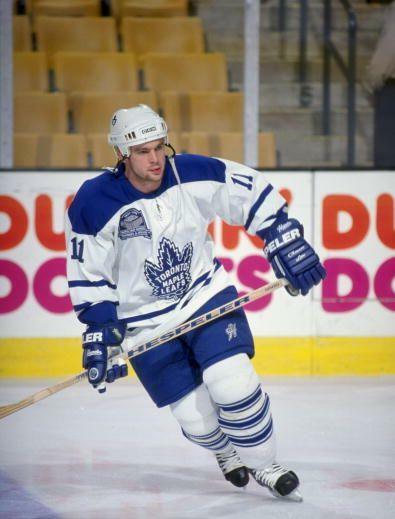 #11: Toronto trades Kenny Jonsson, Sean Haggerty, Darby Hendrickson and a 1st Round Pick in 1997 (Roberto Luongo) to the New York Islanders for Wendel Clark, Mathieu Schneider and D.J. Smith. Okay, first off you can COMPLETELY ignore the fact that the Islanders selected Luongo. There is no guarantee that the Leafs would have picked him. Had the Leafs owned Luongo’s rights and traded HIM to New York, then this trade would be much higher on the list. Anyways, fans were SCREAMING for Wendel to return to Toronto, and ownership sadly listened. Clark got 15 points in 13 games after returning, and then scored 30 goals the next season. But Fletcher alledgely turned down an offer of a 1st rounder from Pittsburgh for Clark that year, uttering the infamous “draft-shmaft” quote. Clark played one more mediocre season in Toronto before leaving as a free agent. Meanwhile, while Haggerty was a bust and Hendrickson was back in Toronto the next season, Kenny Jonsson was a fixture in New York for a decade. He played 597 games for New York, recording 232 points, many of them in a time where quality Leafs blueliners were few and far between. Never mind the first rounder; Jonsson was a rare gem; a Leafs draft pick that blossomed, and played quality hockey for nearly a decade. Mathieu Schneider is the only reason this trade wasn’t in the “Top” 10; he was solid for the Leafs, and then traded for Alex Karpovtsev, who in turn brought in Bryan McCabe. Still, an awful trade compounded by the fact that Clark walked for nothing, and he could have brought a first rounder back. I know this was a longer read for a blog, but like I said; I’m a long-time Leafs fan, and this blog has finally given me a forum to vent on just how frustrating it can be to BE a Leafs fan at time. I hope you’ve enjoyed Part 1; Part 2 (Trades #6-10) is posted here, and Part 3 (Trades #1-5) is posted here. Feedback is always welcome!